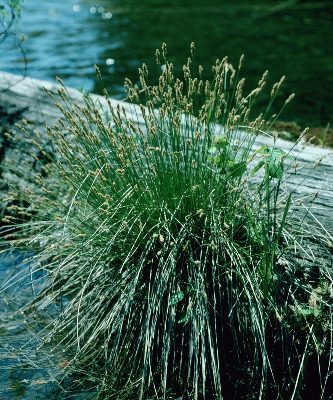 Fens, calcareous sedge meadows, openings in cedar swamps, calcareous shores and seeps; particularly characteristic of sandy-marly flats and interdunal swales along the northern shores of Lakes Michigan and Huron. This is a major dominant of fens and calcareous shores, usually occurring in dense clumps. Inflorescences are highly variable; some plants are largely male, with few or even no perigynia in the spikes and others are mostly female, with few or no male flowers, these looking quite different. Baffling at first, once one is familiar with the species, this odd feature makes it easy to recognize. MICHIGAN FLORA ONLINE. A. A. Reznicek, E. G. Voss, & B. S. Walters. February 2011. University of Michigan. Web. April 21, 2019. https://michiganflora.net/species.aspx?id=1054.